The Bletterbach Gorge: an Open Book on the Geological History of the Dolomites. The Bletterbach system – the smallest and most unusual unit within the Dolomites UNESCO World Heritage Site – is situated at the outlet of a deeply-cut tributary valley that flows into the Adige just south of Bolzano/Bozen. It is bounded by the villages of Aldino/Aldein and Redagno/Radein, by Monte Pausabella/Schönrast and the Oclini Pass/Jochgrimm (1,989 m). An important geological fault-line – the Trodena line – passes right through the area, and it is well represented by the presence – either side of the pass – of the 'twin peaks' of Corno Bianco/Weisshorn (2,317 m), made of white calcareous/Dolomite rock, and Corno Nero/Schwarzhorn (2,439 m), of dark volcanic origin instead. The Bletterbach is in fact a deep gorge carved out by a stream bearing the same name, which over the millennia has eroded the valley, cutting deeply into the succession of layered rocks that underlie the base of the Dolomites. This valley, which is several kilometers long and up to 400 metres deep, unassuming as it may seem at first sight (it is in fact almost concealed), has brought to light a cross-section of rocks ranging from the Permian to the Middle Triassic, and therefore offers detailed information on a long sequence of geological events. The Bletterbach is one of those few places providing an immediate visual representation of the geological history of the Dolomites – a story which is transfixed here in a succession of layers of sedimention, and which offers also extraordinary evidence of that distant past. Impressed in the layers of rock, one can find an astonishingly detailed documentation that dates from the Upper Permian and thus witness the gradual, progressive advance of the Thetys sea on what were then dry, arid plains. The rocks bear evidence of the climate, plants and animals (through the footprints of reptiles and other amphibian creatures) that once lived in those environments. All these events and presences are neatly registered in the rock layers ('strata') with absolute precision and in fine detail as in an open book, making this place a site of unparalleled geological value. A cross-section of the Bletterbach would illustrate a splendid succession of continental and marine environments, ranging from the Upper Permian up to the Middle Triassic, offering with its rock layers an exceptional stratigraphic representation of those key periods, pivotal for understanding the history of our planet. The Bletterbach gorge is particularly spectacular as the stream carved out its way among several layers of rock, thus putting in stark relief the modelling processes linked to the resistance of the different types of rock to erosion ('selective erosion'; see image above). Despite being quite distant from the most renowned and better known Dolomite peaks, this area represents nevertheless – with its sheer 900 metres drop from the top of Corno Bianco/Weisshorn (2,317 m) to the bottom of the gorge – one of the most thrilling descents in time, providing an exciting representation of the origins of the Dolomites, whose geological history is laid bare before our eyes. 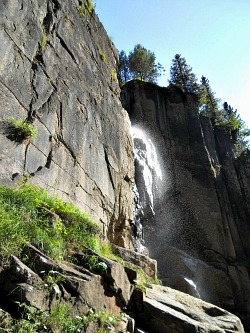 The Bletterbach – also known as ‘Rio delle Foglie’ in Italian – is a canyon in South Tyrol, situated at the foot of Corno Bianco/Weisshorn (2,317 m) and in the vicinity of the village of Aldino/Aldein, where it forms the biggest natural gorge in the province (see image above). This canyon is very interesting from a geologic point of view, as from here one will get the chance to observe both the structure of a deep gorge and learn at the same time about the creation of the Dolomites. Along the trail one can easily distinguish different layers laid on top of each other, which contain many traces of reptiles and fossils (snails, for instance). The geologic amphitheatre of Bletterbach can only be reached by foot, either from the village of Aldino/Aldein (already mentioned above) or also from the hamlet of Redagno/Radein. In terms of its history, the Bletterbach was mainly connected to the mining industry: miners who, in fact, were in search of copper would dig tunnels into the deep sandstone layers – never with great success, though. 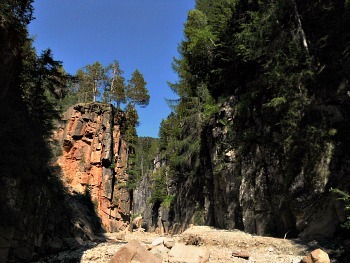 Today the Bletterbach doesn’t attract miners anymore, but rather tourists and visitors – as well as being a meeting point for geologists, who have been studying this canyon since the 1940s. It was following such studies that the Geologic Museum in Redagno/Radein was created. At the museum are collected the dinosaur’s footprints found in the gorge, amongst which is Pachypes dolomiticus, as well as rock examples – such as the Val Gardena Sandstone – and fossils of fish and cephalopods (mollusks that resemble shrimps). 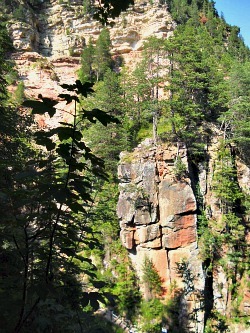 The so-called ‘Bletterbach Geopark’ trails allow to look inside the mountain, and give one the chance to observe how the canyon carved its way for about 8 km among steep mountainsides, with a depth of 400 metres, observing all the while evidence from the different geologic eras from Permian to Triassic. Along the main trail 16 plaques are on display, which illustrate the canyon’s secrets on some of the finds along the gorge, as well as on the galleries dug by the miners and some of the local legends (such as the Golden Pot and Giant Grimm). From the car park by the new visitor centre – situated in the proximity of Malga Lahner – a trail suitable for all departs, which leads to the beginning of the gorge via a country lane. More adventurous is the path that from the parking descends down into the gorge by the Taubenleck and from there rises along the canyon until the beginning of the Bletterbach itself, where one will be greeted by the majestic waterfall of the Butterloch – a stream whose course one can then follow with the help of two fixed, long iron ladders; from there, one finally re-descends towards the first path (see below an image of one of the small small cascades encountered along the path). The first trail is not particularly difficult, but one has to be equipped with appropriate footwear (in any event, the area is subject to sudden small floods, so do not expect to exit the gorge completely dry anyway! ); the simplest roundtrip excursion lasts about 2 hours, even though longer options can always be devised to suit one’s abilities and desires. 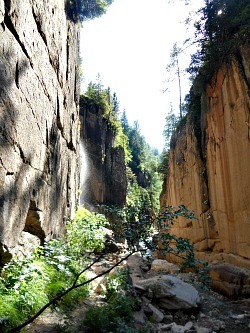 The canyon can in fact be reached, via a longer route, also from Redagno/Radein, where a trail starts by the church of St. Wolfgang and leads directly to the Taubenleck. 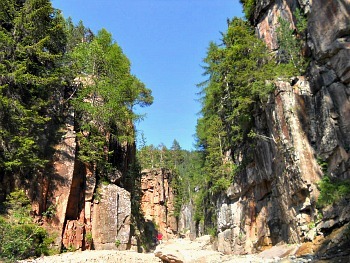 The ‘Geopark’ and its annexed educational facilities (museum, visitor centre) are officially open in the summer season only (from April to October), but the site can be visited at all times of the year, even though – for safety reasons – a visit to the gorge is not recommended during storms, in winter and at thawing. It is also worth mentioning the fact that the Bletterbach gorge is situated very close to one of the five Natural Parks of South Tyrol, namely Monte Corno-Trudnerhorn (in the closing image, another picture of the beautifully coloured rocks along the canyon).